WASHINGTON (AP) — Anyone who paid attention to a hearing in Congress this week knew that the administration had been implored to beef up security at the U.S. Consulate in Libya before the deadly terrorist attack there. 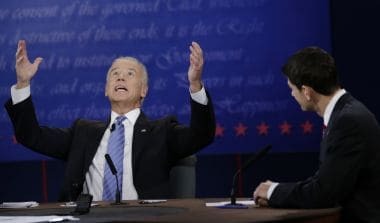 But in the vice presidential debate Thursday night, Joe Biden seemed unaware. “We weren’t told they wanted more security there,” the vice president asserted flatly. 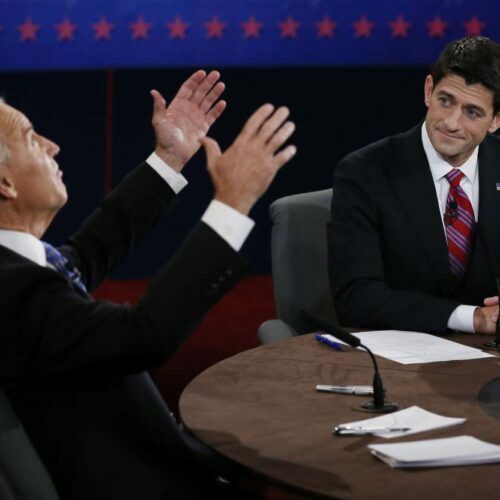 During a night in which Biden and Republican rival Paul Ryan both drifted from the facts on a range of domestic and foreign issues, that was a standout. THE FACTS: Dismissing an entire package of energy stimulus grants and loans as “green pork” ignores the help that was given to people to make their homes more energy efficient, grants to public entities constructing high speed rail lines and tax credits to manufacturers to install equipment fostering cleaner energy. To be sure, there were notable failed investments, such as $528 million to the politically connected and now-bankrupt solar power company Solyndra. But Ryan’s claim made it sound like every penny went down the drain. More broadly, economists are nearly universal in saying Obama’s $800 billion-plus stimulus passed in early 2009 helped create both public-sector and private-sector jobs, even if they fell short of what sponsors had hoped. Douglas Elmendorf, director of the nonpartisan Congressional Budget Office, estimated the stimulus saved or created more than 3 million jobs. THE FACTS: Actually, the auto bailout of General Motors and Chrysler began under President George W. Bush. The Obama administration continued and expanded it. THE FACTS: Ryan is referring to the Independent Payment Advisory Board, created under President Barack Obama’s health care overhaul law. It has the power to force cuts in Medicare payments to service providers if costs rise above certain levels and Congress fails to act. But it doesn’t look like the board will be cutting Medicare “each and every year,” as Ryan asserts. Medicare costs are currently rising modestly and the government’s own experts project the board’s intervention will not be needed until 2018 and 2019 at the earliest — after Obama leaves office if re-elected to a second term. THE FACTS: Obama’s proposed tax increase reaches farther down the income ladder than millionaires. He wants to roll back Bush-era tax cuts for individuals making over $200,000 and couples making more than $250,000. THE FACTS: The requirement under the health care law that most employers cover birth control free of charge to female employees does not apply to churches, houses of worship, or other institutions directly involved in propagating a religious faith. It does apply to church-affiliated institutions such as hospitals and charities that serve the general public. THE FACTS: GOP presidential candidate Mitt Romney has gotten endless grief through the campaign for the headline put on his November 2008 opinion essay that he wrote for The New York Times. But his point was never that he wanted the auto industry to go down the tubes. Romney opposed using government money to bail out Chrysler and General Motors, instead favoring privately financed bankruptcy restructuring. His prescription seemed improbable. Automakers were hemorrhaging cash and the banking system was in crisis, so private money wasn’t available. Without the government money, it’s likely both companies would have gone out of business. Romney did propose government-guaranteed private loans for both companies after bankruptcy. RYAN: “We should have spoken out right away when the green revolution was up and starting, when the mullahs in Iran were attacking their people. We should not have called Bashar Assad a reformer when he was turning his Russian-provided guns on his own people. THE FACTS: Both are correct, but incomplete, when sizing up the effect on small business of raising taxes for individuals making more than $200,000 and married couples making more than $250,000, as Obama wants to do. Republicans say that would hit small-business owners who report business income on their individual income tax; Democrats say the overwhelming majority of small businesses would not be affected. According to a 2010 report by the Joint Committee on Taxation, the official scorekeeper for Congress, about 3 percent of people who report business income would face a tax increase under Obama’s plan. That support’s Biden’s point. The same report says those business owners account for about half of all business income. That supports Ryan. RYAN: Notes that there have been four rounds of U.N. sanctions on Iran to deter its nuclear program, three during the Bush administration and one under Obama. “And the only reason we got it is because Russia watered it down and prevented the sanctions from hitting the central bank. Mitt Romney proposed these sanctions in 2007. In Congress, I’ve been fighting for these sanctions since 2009. The administration was blocking us every step of the way.” He also noted the administration has granted 20 waivers to the sanctions. THE FACTS: The argument that the administration was watering down or delaying sanctions is misleading. For sanctions to work, they need maximum global agreement and cooperation. Russia watered down U.N. sanctions not only under Obama, but also under Bush. And it’s highly unlikely that a Romney administration, particularly led by a candidate who says Russia is the biggest geostrategic threat to the U.S., would be able to get Russia completely on board with what the U.S. wants to — either in Iran or Syria. The more absolute U.S. sanctions that Ryan and others have pushed in Congress would have punished U.S. allies, including most countries in Europe as well as Japan and South Korea, along with good friends like India and Singapore — without the exemptions that were put in place. The administration has indeed granted 20 waivers, to countries that made significant reductions in Iranian oil imports. And the sanctions are pinching; Iran has been convulsed over the past week with protests over the collapse of its currency, which most people say is a direct result of the sanctions that the U.S. and others have imposed. Associated Press writers Bradley Klapper, Tom Raum, Ricardo Alonso-Zaldivar, Stephen Ohlemacher, Tom Krisher and Matthew Lee contributed to this report.